We knew this day was coming, but that doesn’t mean we should be any less excited it’s finally here. Yamaha has pulled the wraps off the Tracer 700, a new upright sport-touring bike based off the FZ-07 naked bike we’ve all come to love. Ok, so my content might not have a home for a minute, but after and epic weekend of motorcycle racing, Lorenzo going to Ducati, a beautiful new Harley Davidson reveal, Bell re-launching the Moto 3 helmet, and now this - well I just couldn’t keep my mouth shut. Especially since no one else seems to be writing about this yet. Who knows, maybe people will read it. The Tracer 700 is a new, mid-sized upright touring bike from Yamaha. The Tracer name is Europe’s version of what we know as “FJ” here in the states (their Tracer 900 is our FJ-09). As such, it’s basically a modified FZ-07, given taller suspension, wind protection, more room for a passenger, and some luggage bits. Think of it as Yamaha’s version of the Kawasaki Versys 650. Only better. As a fan of the FZ-07 over the FZ-09, this is fantastic news. That 698 cc twin is an incredible little motor, especially with a pipe and a tune. The FZ-07 is probably my most recommended bike but, depending where this lands price-wise, that could change real soon. 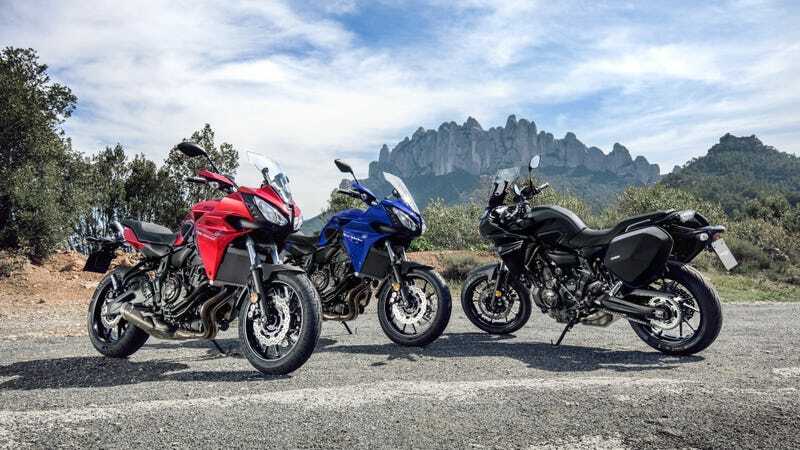 To make this more long-distance capable, the Tracer 700 gets a 50 mm longer swingarm, and a new suspension setup likely a little more tuned for a passenger and/or gear. Like the FJ-09, it gets a dual headlight (one for regular and one for high beam), brush guards, and optional luggage and windscreen options.